According to the calendar, the Class 6A state soccer playoffs don't start until Oct. 27, but don't tell the West Linn and Lake Oswego girls teams. The Lions and Lakers hooked up in a playoff-level battle on Thursday, battling tooth and nail for the 2018 Three Rivers League title at Lake Oswego High School. In the end, West Linn scored once in each half, kept Lake Oswego out of goal and pulled away to win 2-0. "We did everything right; it just felt unlucky," said Lake Oswego senior goalkeeper McKinley Mullen, who finished with a dozen saves. "We're just going to keep working at it and get better as a team." "As a team, we knew this was going to be a physical game, and from the get-go, we said we need to win our own battles, the 50-50 (balls, the one on ones) — that was our biggest focus tonight," said Lake Oswego junior Taylor Jones. "Individually, I think we did our best to do that. We all came out as hard as we could." With the defeat, Lake Oswego suffered its first league loss, saw its six-game winning streak snapped and fell to 5-1-0 in TRL play and 8-5-0 overall. For West Linn, the win marked its 11th straight victory and lifted the Lions to 6-0-0 in the Three Rivers League (12-0-1 overall) and wrapped up at least a share of the TRL title. "We were just trying to win the game," said West Linn junior forward Jill Brody, who scored her team's second goal on Thursday. "We have been super tight this entire season, and in this game, … we felt that even more as a family. That was just our main goal, to win, to come out and play as hard as we could and I think we executed that." "This has been our goal for the last three years and this is as close as we have come to reaching it," said West Linn senior defender Rae Peters, one of the players who helped shut out the Lakers. "This was the biggest game for achieving that goal and it's just so exciting to be right there and have it in our hands." The two teams battled on even footing at the start of Thursday's contest, with West Linn managing a couple early shots — both stopped by Mullen — while the Lakers didn't get their first shot on goal until 16 minutes into the game. But it was at the end of the opening half when things got crazy — and when the Lions broke through for their first goal. With four minutes left in the half, the Lions pushed the ball into Lake Oswego's final third and earned a series of five corner kicks from Peters. Three of those came up empty and one turned into a header by senior Rosie Larsen that Mullen stopped, but Peters' fifth corner struck gold. Her kick from the right side went into a crowd at the left post and senior Calli Masters knocked it home with her knee to make it 1-0 with 1:16 left in the half. "It was a little bit of a bouncing ball around the box — that happens a lot with our team — and I just got a little knee on it and that's sometimes all you need," Masters said. Despite that goal, the Lakers knew they'd played well defensively and were proud of their efforts. "Their first goal was a lucky one and I think that we rose to the occasion after that," said Lake Oswego senior defender Grace Marshall. "Once they upped their level, we upped our level as well and kept the game going." Lake Oswego and West Linn carried their battle into the second half, and while the Laker defense held its own early on, the Lions broke through to make it 2-0 14 minutes into the period. Brody was awarded a direct free kick from 25 yards out, blasted her shot around the Lakers' wall and into the top left corner of the goal with 26:37 left in the game for that two-goal edge. "I just kind of lined it up and I could see the wall in front of me. They kind of moved to the left and I couldn't really see much of the goal, so I was like, 'OK. I've got to take the shot for what it is' and I kind of just hit it perfectly," Brody said. While neither team would score in the remaining minutes, Peters came close when she headed a corner kick by Kaylie Brown off the right post with 22 minutes left. 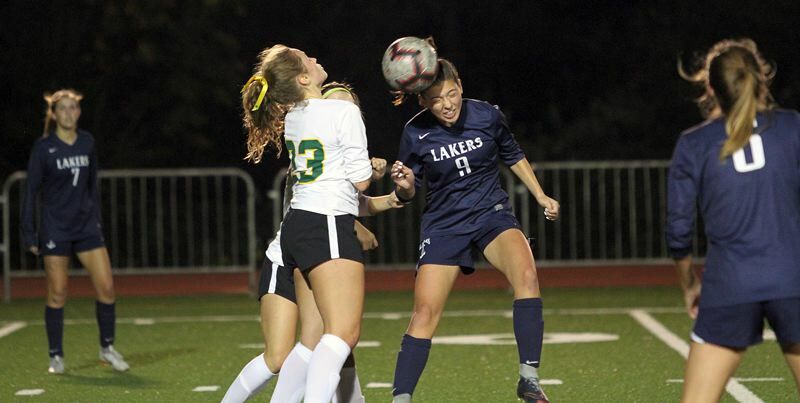 On the Lake Oswego end, the Lakers' best chances came on a long free kick by junior Lily Sieber in the final 10 minutes, and another Sieber shot stopped by West Linn senior keeper Alyx Burkhartzmeyer with six minutes to go. "We've been working this whole season on making sure that we are talking, connecting more, having cover and working on that, especially at practice," Peters said of her team's defense. "We knew that their forwards would be fast so we just made sure we had them covered and we talked a lot as a line and worked together and tried not to get spread apart." "I think this game was a wake-up call for us because going into the playoffs, this is what every game is going to need to be like for us," Jones said. "We can't be lackadaisical; we have to come up for all 80 minutes just like we did tonight. If we keep our efforts up like we did tonight, we will get results." Next up, West Linn closes the regular season with a home game against Canby at 7:30 p.m. Tusday. Lake Oswego closes out TRL play with a game against St. Mary's at Buckman Field (at the corner of Northeast 12th Avenue and Everett Street in Portland) at 6:30 p.m. Tuesday.